REMUS is our current star and has already amassed a very impressive show record. REMUS has been twice V Rated at Specialty Level and both were attained before his second birthday. Remus' Sire is ENG.CH. FERNWOOD LIONHEART, who is a full brother to ENG.CH. FERNWOOD FALLON and ENG. & IRISH CH. FERNWOOD FIRECRACKER. His Dam, FERNWOOD GENIVEVE, is a full sister to ENG.CH. FERNWOOD HORATIO, ENG.CH. FERNWOOD GANEMEDE and INT.CH. 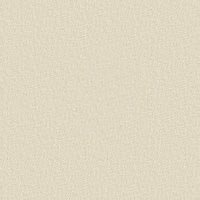 FERNWOOD GEISHA. His Grandsires, ENG.CH. FERNWOOD ENFORCER and ENG.CH. POIROT WHAM, need no introduction. His full brother, ENG.CH. FERNWOOD STRIKER, was made up a Champion in September of 1999. More importantly, REMUS has an outstanding temperament and is a wonderful companion. He adores my twelve year old Chihuahua and is great with children. REMUS has a big future and we look forward to the 2000 show season and beyond. 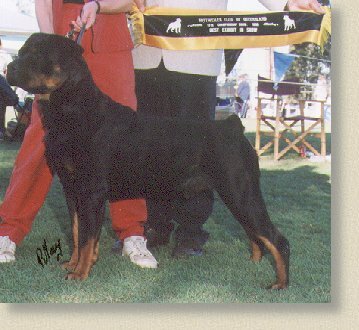 and a half years of age this makes him Australia's youngest GRAND CHAMPION Rottweiler. Well done Remus you are a true Champion in every sense of the word. Remus will now be enjoying a much earned rest. Puppies by Remus will be available later this year.
" Large, strong dog of excellent type. Strong head with short and broad muzzle. Deep and broad chest. Straight back. Muscular hindquarters with medium angulation. Straight in front. Red/Brown markings.